Yesterday, March 21, the first Rufous hummer this year showed up at our feeder. Today he was zipping by my head while I was in the garden. I love spring!! I don't have a record for last year but two years ago the first Rufous arrived at our feeders on March 19. Since 2012 is a leap year, the one I saw yesterday arrived just one day later. Colin at the Backyard Bird and Nature Store in Nanaimo reports that they have had reports of Rufous from as far north as Qualicum Beach so far. 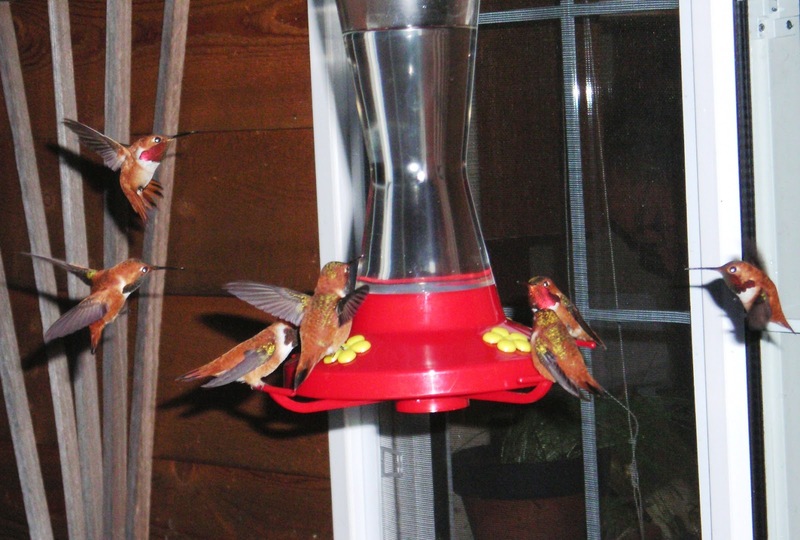 Is your hummer feeder up? The Rufous hummingbirds have completed most of their 6000 kilometre migratory journey from Mexico, were seen early this week in southern Vancouver Island, and should be here on Gabriola very soon - or might be NOW! I read in Monday's Sounder that someone reported Rufous hummers already flitting around the island, and I must admit I thought I saw one in our Japanese cherry tree last Saturday BUT I didn't have my binos with me and didn't get a good enough look to know FOR SURE that it wasn't an Anna's - which are here year round. 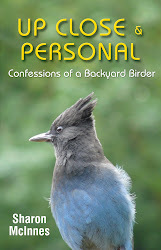 So I contacted the 'senior' birders ar Birding in BC for info. Those who responded said there have been no confirmed reports of Rufous in the mid-island-Nanaimo area yet. If you think you've seen a RUFOUS hummer on the island already (look for the rufous-coloured sides on both male and female) please leave a note in the Comments section below. In any case, it's definitely time to put out your feeders. One part white sugar (not honey or organic sugar or any other 'healthier' alternative) to 3 1/2 to 4 parts water should do it. Please do not colour the water! The red dye isn't good for the hummingbirds and is unnecessary, since they are attracted by the red of the feeder itself. And please be sure to refill and clean your feeders every week or so - and more often once it warms up. For me, the answer is "No, it isn't better for them." 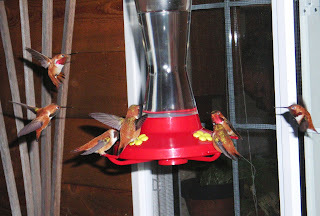 In an undeveloped, pristine, edenic world, the hummers would, I'm sure, not need artificial feeders to help them refuel after their 6ooo kilometre trip from Central America, but that's not the world we/they live in. Providing nectar is the LEAST we can do, given all the plundering and deforestation and pollution and other acts of violence against the earth we, as a species, have already committed - and continue to commit. This just makes their migratory journeys more and more challenging. The value of human-supplied nectar lies not only in its ready availability but also in its 'efficiency' for the hummers. In a 2011 study (Dartmouth University) researchers confirmed that hummingbirds (unlike humans!) feed according to "Optimal Foraging Theory". Basically, this means that their intent is to balance the energy spent finding food with its caloric benefit in order to maximize their chances of survival. (In human terms, they wouldn't bother eating donuts because the nutritive value isn't worth the time and energy spent to ingest then digest them.) Since the flowers that hummers eat from produce just enough nectar to allow them to be pollinated, hummers need to expend energy flying from flower to flower in order to find sufficient nectar. Given their high metabolism and energy requirements, there is a point at which a cost-benefit analysis says 'this just ain't worth it'. That's why, according to the Dartmouth study, hummingbirds aim to choose the largest flower patches with the 'sweetest' nectar concentrations. (To read the summary of the study from the Dartmouth Undergraduate Journal of Science, go to http://dujs.dartmouth.edu/wp-content/uploads/2011/06/11s_final-34-36.pdf) This is why I continue to advocate for feeders. Just make sure you don't wear red in the vicinity!